During all the great announcements and features revealed at the Windows Phone Developer Summit, Microsoft also celebrated some marketplace milestones. The Windows Phone marketplace has now grown to 100,000+ applications. On average, more than 200 titles become available each day on the Windows Phone marketplace. This milestone actually surpasses the application growth rate of the Android platform to the same amount of applications. To mark the milestone, today we’re announcing a new batch of marquee titles. The official Audible app for audiobooks arrives in Marketplace today. Official apps from Chase and PayPal are in the works. Gameloft has Windows Phone versions of Asphalt 7: Heat and N.O.V.A. 3 Near Orbit Vanguard Alliance on the way. And Nokia is helping deliver the much-requested Zynga games Words with Friends and Draw Something to Windows Phone later this year. At the time of writing this post, the Audible application is still not available through the marketplace via search. As soon as the Audible application becomes available we will surely post about it. Also, we noticed in the slide during the Developer Summit keynote, and it was also demoed, that Fairway Solitaire is also confirmed. So, that makes three official applications announced: Audible, Chase, and PayPal. 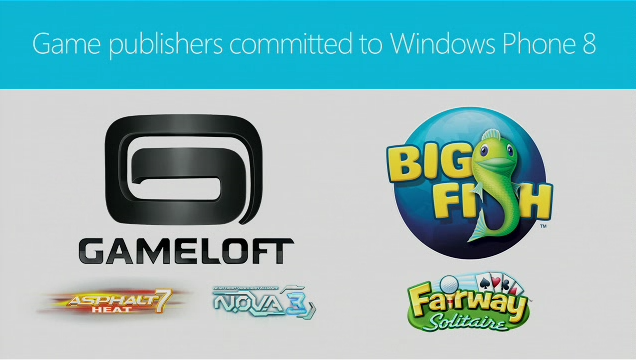 As far as games, some great titles will also soon be available on the Windows Phone: Asphalt 7: Heat, N.O.V.A. 3 Near Orbit Vanguard Alliance, Fairway Solitaire, Words with Friends, and Draw Something. With Windows Phone 8 releasing in the fall of this year, and all these great applications and games so far announced, it’s going to be a great year for Windows Phone!